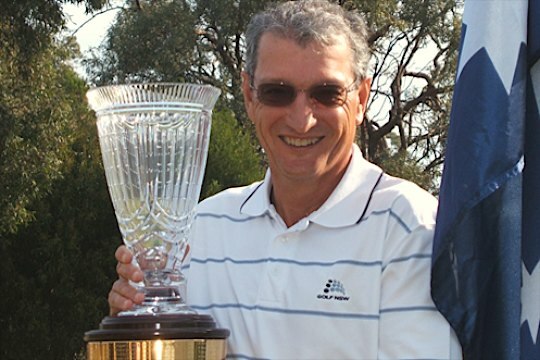 Overnight leader Stefan Albinski successfully defended his Australian Men’s Senior Amateur Championship with a five stroke victory at Tanunda Pines Golf Club in South Australia’s Barossa Valley. Leading by three strokes overnight, Albinski (Mona Vale) closed with a 2-over par 74 to be at 6-over for the championship. “This is the greatest win as it now puts me in the company of the greats of senior golf including Tony Gresham, Rodney Barltrop and Trevor Wood who have won the title three times,” Albinski said. “I played solidly all week without any silly errors. My worst score on any hole was a bogey, which was good around this tight layout,” he added. Albinski’s other wins came in 2010 at Royal Canberra Golf Club and in 2008 at Royal Perth Golf Club. Joint 2007 Champions Rick Oliver (NSW) and Denis Dale (NSW) finished second and third at 11-over and 14-over respectively. Queensland’s Peter King finished tied with Paul Maslen (NSW) in fourth place. The ACT’s Bill Banks finished in sixth place with Richard Greville (NSW). NSW won the teams event by 18 strokes from Victoria in second place.